I was delighted but not surprised to read that grandparents believe their well-being and mental health is boosted after spending time with their grandchildren. A study commissioned by Parkdean Resorts in conjunction with biogerontologist Dr James Brown highlights how grandparents who interact and play with their grandchildren experience improved moods, memory, physical well-being and less loneliness – all of which can be conducive to a happier and healthier life.These unique and very special relationships also bring a wealth of benefits for grandchildren – particularly in situations where their parents separate or divorce. As a niche family law firm we acknowledge and applaud the formative role that nanas and granddads play in their grandchildren’s lives as carers and role models. The pressures of parents juggling work and family life see grandparents taking on increased responsibilities in childcare, babysitting and coming to the rescue if children are ill.
Their relationships with their grandchildren are usually more relaxed. They are nurtured and developed in an environment where youngsters can have ‘down time’ away from the stress of their parents relationship problems. If situations escalate – leading to mums and dads separating or divorcing – grandparents’ homes represent an oasis and bedrock of stability where they can open up about their feelings. 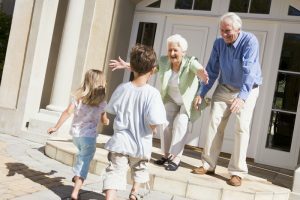 Providing a vital sense of normality, grandparents go a long way to keep grandchildren’s daily routines, particularly in the early days of divorce, as well as supporting their own children practically and emotionally. It is important that they remain in close contact with their son/daughter and with their ex-daughter-in-law/son-in-law to ensure the children’s interests always come first. While grandparents will understandably want to give their grandchildren time and space to share their emotions about their parent’s break up, they are advised to avoid criticising the parents. In spite of the complexities and practicalities over visiting and planning which arise from divorce and separation, we always recommend that grandparents remain focused on their special relationship with their grandchildren. This includes reassuring them how their parents break up is not their fault – and how much they are loved by their parents and their grandparents. Getting this right will go a long way to help children’s stability and development in their formative years ahead.